Eleven-year-old Parvana comes from a family of storytellers. Her Mother Fattema is a writer and her Father Nurullah is a teacher. At the start of the film, Parvana’s father is building a shelter of hope in an oppressive climate. He’s lost a leg to war and his profession to tyranny. He and Parvana are on the street selling prized possessions as merchandise because their household needs the money. Still, he uses his vocation to offer reading and writing services to the illiterate of Kabul. The Breadwinner is about the survival of bravery, ingenuity, hope and family in a constricting regime. It is also about the importance of story. Personal story, cultural history, and folklore can all inform, soothe, fortify, and celebrate. The invention of story can become an incantation summoning strength. Parvana and her Father are immediately faced with threat. A verbal attack by a couple of young Taliban men, one of whom Parvana’s Father used to teach, clearly spells out societal restrictions. A girl must cover herself. She must not bring attention to herself. Narullah attempts to reason with the young men, arming himself with resolute hope, while Parvana tries to hide in plain sight. The family of five is living in one room. The situation becomes dire when the young Taliban men from earlier in the day come to arrest Parvana’s Father for teaching women and having forbidden books. Women and girls over a certain age aren’t allowed out of the house without the accompaniment of their husbands, brothers, or sons. After Narullah is imprisoned, the family is isolated by default. Parvana, her Mother Fattema, her older Sister Soraya, and her baby Brother are interned by rule. They must break edicts to survive. The Breadwinner utilizes slow pans of the dusty city. 3D elements incorporated into the 2D environment punctuate changes in story movement and convey a depth of journey. Buildings and roads, military trucks and abandoned Russian tanks seem to become representative of obstinate and unconquerable obstacles. In contrast, the natural acting of the character animation is weighty and graceful. Small gestures speak volumes. The character design is uncomplicated and appealing. Great animation makes you care. A secondary story is interwoven through the narrative of the film. It is a folktale animated in a cutout style and seems to resemble a lush and intricate quilt. The tale of a young boy who must stand up to the Elephant king to save his village is crafted by Parvana to soothe her baby Brother. The narrative of the folktale is a tangled yarn moving on its own vitality. It is the story of a child taking on an adult role, fleeing from fear, suffering defeat, accepting assistance, and finding the courage to fight. The tale is both a diversion and a utility for the characters in the film. An attempt at retrieving Parvana’s Father Nurullah results in the beating of Parvana’s Mother Fattema and a forbidden photo of Parvana’s Father is ripped up and thrown into the wind. The family is at a crossroads. The household is running out of food and Parvana makes a decision. In a moment of silent sibling communication, Parvana’s older Sister Soraya helps Parvana cut her hair. When she unveils her appearance, having bobbed her hair and donned her deceased Brother’s garments, Parvana’s Mother states, “You look like Sulayman”. The details of her late Brother’s death are painful for the family and divulged during quiet moments of the film and in the emotional finale of the folktale. The hero of that tale is named for her Brother. Returning to the market as a boy, the colors now seem a little brighter. Parvana is recognized by an old classmate named Shauzia who is also disguising herself as a boy. Shauzia feels bound by duty to support her family even though she has a strained relationship with them. At one point in the film she states, “I am a good son but [my father] is not a good father”. Parvana learns with Shauzia’s help “when you are a boy you can go anywhere you’d like”. She is still confined by circumstance and this is made clear to her when she witnesses an attack on a Mother and Daughter. She can do nothing but observe without bringing attention to herself and risking discovery. In addition to selling items from her home Parvana continues to offer reading and writing services. She reads a letter for a merchant named Razaq who has lost his wife Hala to a land mine. He later tells Parvana his wife’s name means “light around the moon”. Razaq becomes a true ally. Parvana and Shauzia create a story for their future. Shauzia dreams of escaping Kabul to live on the beach. She encourages Parvana to join her. They promise to meet 20 years in the future at the shore. There is no goodbye, only “until next time”. Fighter planes fly overhead. The Parvana and Shauzia look up but do not comment. Things get much more dangerous. War is coming. The characters are split apart. The action of the film picks up pace and scenes fire off in a more rapid progression, intercut with the folk tale Parvana is propelling forward. We witness the full crescendo Sulayman’s tale and the arrival of war. The narrative of the film, like the narrative of the folk tale, is at loose ends. It's imperfect. A neat and tidy story lets you walk away and forget. 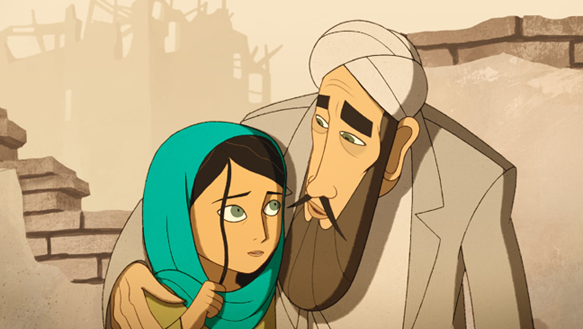 Instead, the story of The Breadwinner clings to you and the characters haunt your thoughts. Art Direction by Reza Riahi & Ciaran Duffy. Produced by Aircraft Pictures, Cartoon Saloon, Melusine Productions, Gaia Entertainment, Gkids, Guru Animation Studio, and Jolie Pas Productions. Distributed by Gkids, StudioCanal, and Elevation Pictures. Music composed by Jeff Danna & Mychael Danna. Parvana voiced by Saara Chaudry. Nurullah voiced by Ali Badshah. Fattema voiced by Laara Sadiq. Soraya voiced by Shaista Latif. Shauzia voiced by Soma Chhaya. Razaq voiced by Kawa Ada. Idrees voiced by Noorin Gulamgaus. The books, written for middle school aged children, are definitely worth your time, too. You’ll have a difficult time putting them down once you pick them up. They emphasize the strong-willed character of Parvana. Her story is based on a true story.